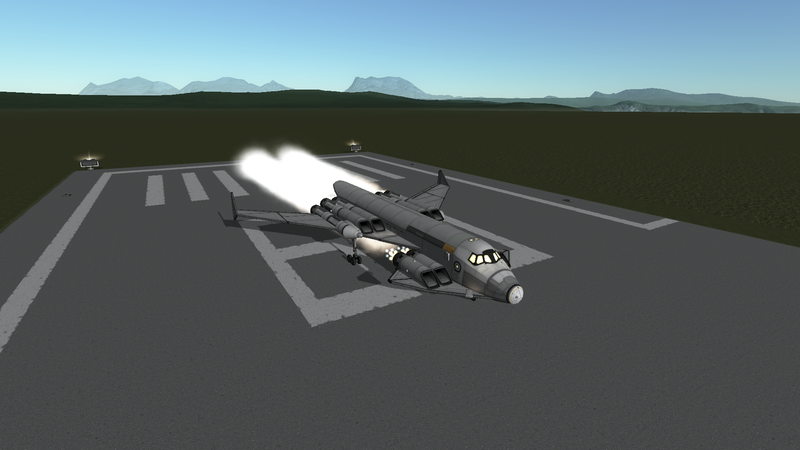 Cargo Transport Shuttle series' first ramp-loading capable SSTO, the Skymaster is developed from CTS-7 Stallion. 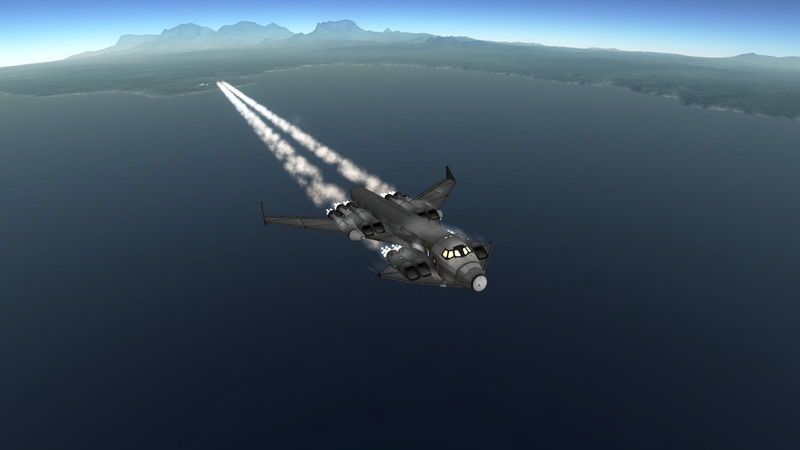 Sporting 10x RAPIER engines, this cargo shuttle craft is capable of putting ~40t of payload to 100x100km LKO. Intended to operate on both Kerbin and Laythe; current variant designation is D.
Pitch up and maintain 10~15deg pitch angle. 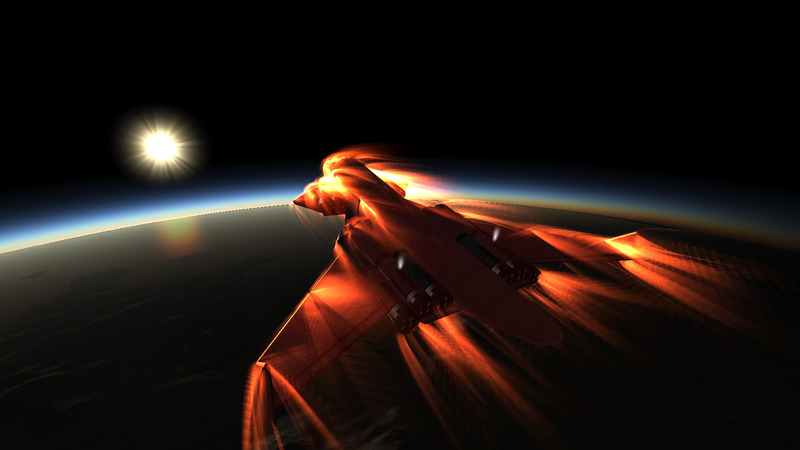 Around altitude of 10km, you should’ve hit Mach 2~3. Around altitude of 15km, pitch down to 10 deg. Around altitudes of 22~25km, switch to rocket mode. Around altitude of 35km, pitch down to prograde. Keep burning until desired apoapsis is met. Deploy solar panels and circularize at AP. As 1.0.5 brought cargo ramp to vanilla, I decided it was time to implement it to main SSTO fleet. One of consistently requested functionality that has been deleted since CTS-5 Skymule was ground steering capability. So instead of nose-mounted LY-50, I reverted back to LY-10 with steering unlocked. And addition of cargo ramp door meant that the new aircraft was to lose rear-dock capability while adding 4t of dead weight. This, combined with stretched cargo bay adding another 1.5t, meant that the prototype had to increase number of engines from traditional 8 to 10 for easier ascent. The increased wing loading had to be mitigated by ~20% increase in wing area to maintain maneuverability. While the new aircraft no longer had to stick with wing-mounted main gears (a crucial feature that enabled bottom-opening cargo bay found in CTS-5 and CTS-7), I left them alone as the wing itself can potentially function as shock absorbers. The resultant aircraft, now named CTS-9 Skymaster, achieved my very own operational certificate when it successfully delivered 41.1t NRX-L module to 100x100km LKO, shown in screenshot. Current variant (D) has improved RCS layout, revised canard control surfaces and slight tweaks to main wing structure.